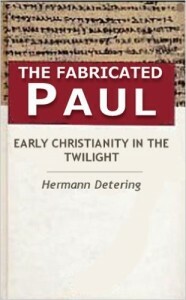 Dr. Detering’s views rendered him a pariah as regards the New Testament guild. This applies mostly, of course, to Europe, where he never held an academic position nor published in any significant academic press. Detering reached out to contacts across the Atlantic beginning about the turn of the millennium. He was a valued and repeat contributor to Dr. Robert Price’s ‘out of the mainstream’ Journal of Higher Criticism. Other scholars, including myself, subsequently translated, promoted, and published his work this side of the Atlantic. Your “Commentary” to my text has itself become a very fascinating opus. Why don’t you publish it in its entirety as a book? In the event that you don’t find a publisher—a common enough problem with such specialized endeavors—self-publishing costs nothing except work. You could add my essay as the first part of the book, to be followed by your commentary—thus, a synergistic dual production. [SW’s] English translation is not the non plus ultra. He certainly would not be opposed were you to rework the translation again. I doubt greatly that he will revisit the task himself. He wanted to revise his translation on the basis of your recommendations anyway, but I fear nothing will come of it. That would be my recommendation. But you must decide for yourself. I personally have no reservations in this regard. But I would also understand if you have other priorities at this time. Yet it would be a pity to leave our various articles [on Buddhism and Christianity] strewn about the Internet. This occurred to me when I considered the time I have left. You see, I can go on for awhile, but I have no assurance for how long. I’ve now completed the third part regarding the Indic elements in Basilides’ thought. 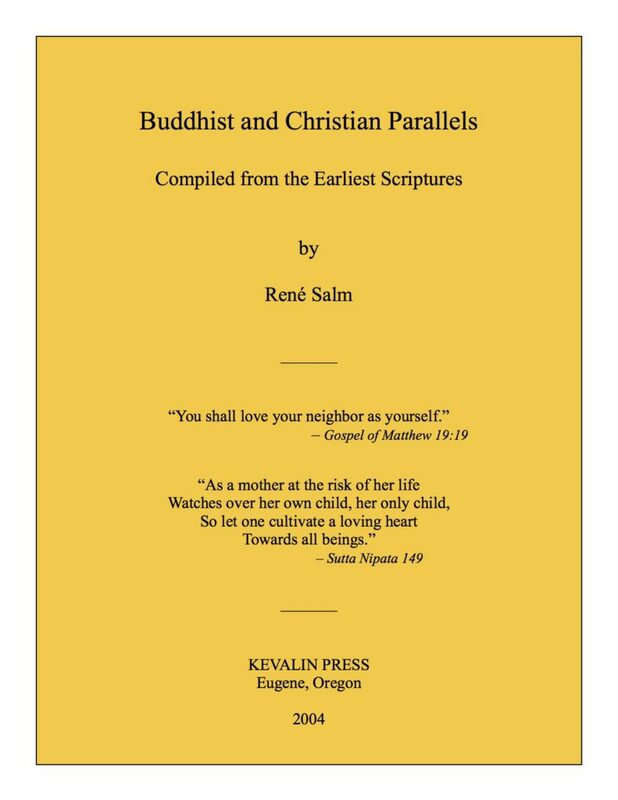 I would dearly love to continue with a consideration of their impact on early Christian literature—the Gospel of John, Colossians, Ephesians, and perhaps a few others where Buddhist influence is quite evident [wo der buddhistische Einfluss am Tage liegt]. Don’t misunderstand me: despite everything, I have not given up. Pathetic though it may be, the fight goes on. I am so sorry to hear the latest news regarding the cancer. Words escape me. I am thinking of you in the coming weeks. About your fine idea to self-publish a combination: your article + my commentary… It is a good idea. But I cannot promise anything. For the last two months I have been quietly ‘leaving’ the field of religious studies. It is not apparent to readers of my blog, but those posts were all written months ago. I publish them online, but my head is already deep into music. I am starting a small music publishing company (www.laureatemusic.com). It will take ALL my energies… The first edition (Children’s Pieces) comes from the printer in October. I would like to send you a copy, because I know how much you like music. You and I also share a deep reverence for J. S. Bach. My second edition (“Preludes and Inventions”) is a tribute to him. It comes from the printer in November, if not sooner. I have gone through my library and have started selling (or giving away) about half the religious studies books. I am keeping only the basics. The commentary series has only 2 or 3 more posts. Then I would like to have a few posts on the Gospel of Barnabas. Then, on to music, with only an occasional post in religion perhaps. It is a big change for me, but at age 66, music calls before it is too late. All the best, Hermann. Über alle Gipfeln ist Ruh, heilige Ruh. One also wonders how long Dr. Detering’s website will remain online. It would be a real misfortune for all those articles to simply disappear in the next year or so. I will consider devoting an ‘area’ of this website towards the preservation of his online work, importing PDFs and other pertinent matter as able. For those who read German, Dr. Hermann Detering’s website is still online as of this writing. He reviews his own scholarly career here. He thoughtfully collected his online articles that have been translated into English here. Thank you very much for this, Jörg. It’s a good first step. 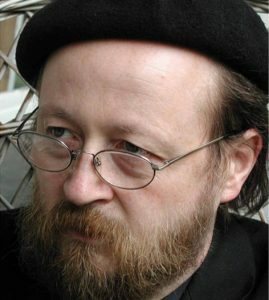 Hermann Detering war ein unbeugsamer Kämpfer gegen eine Dogmatik die sich weit von der urchristlichen Botschaft entfernt hat. Sein ganzes Streben und Schaffen war der Suche nach der Wahrheit gewidmet. Mit seinen kritischen Schriften machte er sich nicht nur Freunde. Seit seinen Auftritt in einer Phoenixrunde, war ich begeistert von diesen kleinen, brillanten Kämpfer. Da diese Thematik auch ein Dauerprojekt in meinem Leben ist, waren wir schnell in einem regen Diskurs und letztendlich richtige Freunde. Ich verliere einen wichtigen Gesprächspartner und liebgewonnenen Freund. Are there copyright problems involved when preserving the articles of HD’s site? I’m no legal scholar, but T. Crawford writes in “The Writer’s Legal Guide” (1998:31): “Publication in the current law basically means public distribution. This occurs when one or more copies of a work are distributed to people who are not restricted from disclosing the work’s content to others.” I think, by putting these articles on his website, Detering was “publishing” them and thus not preventing others from distributing his work.